You play as a Pokemon Ranger in the Oblivia region, tasked with stopping the thieving Pokemon Pinchers with the help of your Capture Styler and assistant Ukelele Pichu. 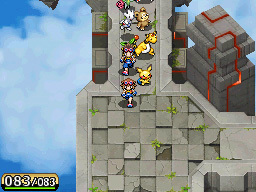 The player must complete missions by using the Capture Styler to "round up" Pokemon on the touch screen by circling them. The Capture Styler can be upgraded with new abilities as the game progresses, allowing it to capture Pokemon of different strengths and types. The player can also use Ranger Signs to summon Pokemon they have befriended during the story to assist. Some missions allow up to four players to take part using a local wireless connection.